T om Snow has enjoyed a 50 year career in the music industry and is best known as a songwriter penning Linda Ronstadt’s hit “Don’t Know Much” and Leo Sayer’s “Thunder In My Heart” plus many more. However, he was a pioneer of the late 60’s and early 70’s country rock scene working with a young and already eccentric Gram Parsons before starting his own band named Country. Whilst he released a number of albums in his own name, the songs on this CD have never been released before and it is thus a treasure trove for fans of music from that era which defined much of what we know and love today as Americana. 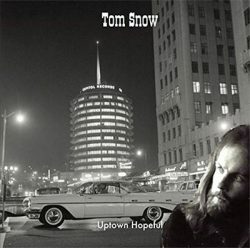 The ten tracks on show were all written by Snow, recorded in LA and were produced by none other than a young Peter Asher. There is a steller list of musicians on show including Danny Kortchmar on guitars, Russ Kunkel on drums and some very nice steel guitar playing by Red Rhodes especially on “Lindy Loo” which showcases a classic country rock sound. The opener “Pioneer” has echos of the American exploring spirit and is followed by “Five Minute Spell” a catchy tune with an upbeat vibe. There is country funk swagger on “I’m a Shadow” which with the right backing could have been a big hit. Listening to this album you would be forgiven for thinking that you had stumbled on a standard of its era with songs evoking the style, spirit and vibe of Pure Prairie League, America, early Dr Hook, England Dan and John Ford Coley and many others. With extensive liner notes including comments from Snow himself this is a valuable addition to any collection and is another piece of the jigsaw piecing together our understanding of this fascinating era.